Two (too) good movies on a day! Went to INOX to watch the spectacular 3D show ‘Avatar’ with my friends. Indeed a mind-blowing film for some of its creativity and imagination on the new species of a different planet. The technology is the actual protagonist of this film and a good message to us is to save the nature and protect the natural beings. Followed by that, watched the latest Hindi blockbuster ‘3 idiots’. Impressed by the screenplay and the core message of the film, which is obvious that ‘freedom of education in choosing the career’. Have read already ‘five point someone’ novel and I agree that many incidents are similar but the movie stands on its own in many aspects. Also I agree that Aamir Khan’s portrayal of inherent intelligence, love to machines, absconding from the material world to establish his own science empire would be comparable to the character John Galt of ‘Altas Shrugged’ novel by Ayn Rand. Club Cabana, I see as a neatly maintained club, is located in north of Bangalore about 18 kms from Hebbal flyover. 17 of our team members started early(?) today in the morning at 8:30 from NetApp office at EGL software park and reached the club around 10:00 AM. With Welcome drink and simple nice breakfast, we’ve started playing Cricket as team activity. Followed that we’ve played Volleyball with participation of all team members. With hungry we had a good buffet lunch and I liked the hot jilabis with ice cream. Then parts of people indulged in Tennis, Pool and other games. Three of us spent quality time in water waves pool and lazy river. After having a nice tea, we were back to our home by having a good chat about college events. Overall it was another memorable team outing. Advise to the people who are visting Club Cabana: Buy couple of tennis balls, cricket balls, squash ball and shuttle corks in Bangalore itself, to avoid shortage in the club. Thanks to Nadasurabhi for presenting a pleasant free carnatic music concert package for this year 2008 in Bangalore. I was grateful to attend the vocal concerts by Unnikrishnan, Sanjay Subramaniam, Priya sisters and Malladi brothers. Since the kutcheri hall was compact, it was a good experience to listen the music there and view the artists from front rows. This song is one among the beautifully rendered Annamacharya krithis in Telugu, emphasizing only one supreme soul exists and all living creatures are equal without any disparity in the world. This song will resemble some folk song rhythms, even though its a Carnatic classical one and hence this stands unique among others. Sudha Raghunathan’s voice is a plus. Simply, I like it. Click the “Track details” to enjoy the same. Yep! Yesterday evening I’ve enjoyed a lot in the IPL twenty-twenty cricket match held at Chinnasamy Stadium Bangalore between the teams Chennai Super Kings and Bangalore Royal Challengers. Mahendra Singh Dhoni was the star player and he acted as a catalyst for taking the Chennai supporters to their down-to-core enjoyment. Once Chennai team won the toss, they went for batting and the initial 15 overs were not much impressive compared to last 5 on accumulating runs by batsmen in arrogant way. For every hits of 4 and 6 runs all of us were dancing, jumping, whistling and shouting. The ice on the cake was the Cheerleaders from Washington Redskin group, who were showing their expertise by cheering up the youngsters between every 2 overs. This Chennai team winning match was worth watching even though the essence of cricket was moderate, it was over-shadowed by film-stars, orchestra, cheerleaders, song-clippings and the zeal exhibited by audiences. These fast-food T20s will make the future of Indian cricket matches as it highly increases the energy level of spectators for affordable 3 hours duration, by combining sports and cinema together. Welcome to the era of vivid profit-oriented business, the so-called “cricket sport”. An online encyclopedia containing 10 million articles – None other than my favorite Wikipedia. What a site! She (wikipedia) reached this milestone 3 days back inclusive of all articles in 250 languages. Name anything in the world, it’ll come under the umbrella of her. She is my default-gateway for any information from Archemedes to Rajinikanth. She gets rejuvenated every second by the contributions of her children world-wide. Recently, I’ve started reading Tamil Wikipedia articles. Trying to be a solid contributor for this great site. I like history and science portals and I like to swim in this ocean of information through out my lifetime. For past 2 months I’m going to Aerobics at my office. Really its a good physical exercise and I feel it keeps me mentally fresh and fit. Doing stretch exercises, sport movements with steppers are helpful in burning calories and increases blood circulation, leads to consumption of more oxygen. At least I’m satisfied by doing some sort of physical activity in aerobics, which is essential for software coolies. I don’t know how this junk movie got 4 Oscar awards!! I was one of the victim to watch this damn film, because of the tag value attached to it. The movie doesn’t have any story line or any concept. The Oscar winning best supporting actor doesn’t even acted, apart from just staring people and saying “Call it”. Couldn’t get what the director tried to convey to audience. Whether no good movie produced last year in Hollywood to get this prestigious award, which was given to wonderful films like Forrest Gump and Titanic? The hype and anticipation around Oscar awards needs to be reduced among people to get into reality. Some of the last year Tamil films like Mozhi and Paruthi Veeran are much better than this because of its originality. Being a software engineer in India, I too got a chance to visit United States of America on my work. I went to NetApp office located in Sunnyvale for an assignment of about one month. 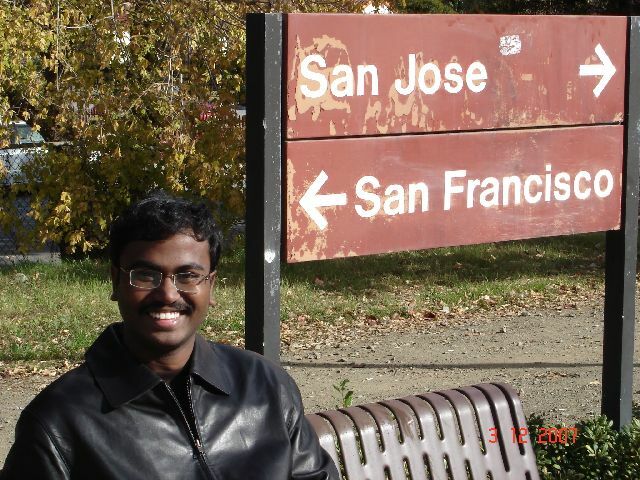 I was fortunate to have my room-mate Ekanth there, who is working in a startup in Bay area. He made my life easier on roaming around places and taking me for regular lunches and dinners to different restaurants. I was staying in Hotel Crowne Plaza, Milpitas and near to this hotel my classmate Kamalakannan was staying in Homestead Studio Suite. It was really surprising for both of us to visit US at same time for same duration and staying very near. So, daily evening I used to visit his room to show my cooking expertise for our dinner. On a weekend, we three went to Sanfrancisco for a day trip and spent time on Golden Gate Bridge. It was a quite different experience to travel in public transport system there. Normally the journey time by a car on freeway from San Jose to Sanfrancisco will take around 40 minutes, but the public transport (except flight) took nearly 2.5 hours because of less-frequent buses and trains on weekend. So we were forced to make several hops like travel by VTA (Valley Transport Authority) light-rail to Sunnyvale downtown, then by Caltrain (California train) to Milbrae station, then by BART (Bay Area Rapid Transport) train to Civic Center station and then by a bus to Golden Gate bridge. Anyway, watching out-side during the journey was good. On the next weekend, we planned to go to Los Angeles city, which is film-entertainment capital of the world. We 7 guys, all are HCL-Cisco ex-colleagues, traveled in a car and reached LA in around 5 hours and stayed in Ramada hotel. The next day Saturday, we went to Universal Studios and it was very nice experience visiting this Hollywood theme park. Here they’ll take for a Hollywood tour, in which they’ll show the set made for famous movies like War of the Worlds, Titanic, King Kong, etc. We went for the thrilling rides in Jurassic Park and The Mummy. There will be many shows running in parallel and one has to run behind the schedule to cover most of it. We had managed to watch Water-world live-show, House-of-horrors, 3D movies on Shrek and Terminator 2, Animal Actors, Fear Factor and Special Effects. I’ve enjoyed much the 3D shows because of fantastic 3D visualizations, sound effects and air-blowing & water-sprinkling on us. Evening we just roamed around Hollywood Boulevard (a famous road in LA) and there we made a visit to Kodak Theatre (where the Oscar Academy awards will be given yearly), Grauman’s Chinese Theatre and Wax Museum. This same road hosts the Hollywood Walk of Fame, which is nothing but the pathway on the side of the road embosses the name of famous celebrities in every star. The next day, we went to Laguna Beach followed by Malibu Venkateswara Temple and headed back to San Jose. During my stay, I went to some fast-food-chains/restaurants like Taco Bell, Chipotle, Togos, Subway, McDonald’s, Java Sushi, Spice Hut, KFC, Starbucks, Swagat, Thai Town and Saravanabhavan. Because of this I had food items in Japanese, Taiwanese, Mexican (Burrito and Chalupa), Continental, Irish, Italian and Indian taste. In the same period, I managed to watch movies too (Om Shanthi Om, Evano Oruvan and Billa) in Century theatre and Indian Movie theatre 6. Before returning, as a ritual went to Costo and bought chocolates and other stuffs. One of the best place in Bangalore and I liked much is ‘The Leela Palace’. I had the opportunity to hang out there, because my office premises were located in that hotel only. I had good time of around 2 years there and I can’t forget my daily afternoon walk in Leela Palace Garden. The Garden and Lobby were designed in such a way that, fresh air always surrounds that area and one can feel that chillness there anytime.